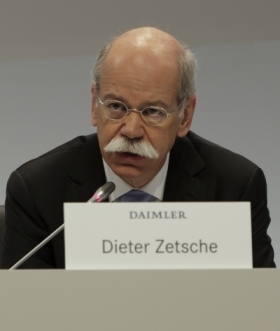 Daimler CEO Zetsche is worried about the impact of inflation in China. NEW YORK/STUTTGART -- Daimler CEO Dieter Zetsche warned of growing economic risks in emerging markets such as China that could cause the auto industry's growth engine to sputter. "There are some clouds on the blue sky," Dieter Zetsche told journalists in New York on Tuesday. Emerging markets have generated almost three-quarters of world growth over the past two years, but there is rising concern that inflation in China -- the world's No. 2 economy -- could prompt a slowdown in emerging markets across the board. Zetsche told Reuters that a number of "difficult events" over recent months -- including the earthquake in Japan, unrest across the Arab world, and still-anemic growth in the United States -- meant that the risks to global growth had increased. "I would see a very small likelihood for a storm coming. It's not impossible ... but our main and most likely scenario is a continuation of the positive development of the world economy," he said. China's consumer inflation hit a 34-month high of 5.5 percent in the year to May. Analysts forecast it would peak in June or July before easing. Premium and volume automakers have looked to fast-growing markets like China to make up for sluggish sales growth in more mature markets, particularly in Europe. But China's car market -- the world's biggest ahead of the United States -- is expected to cool this year, partly due to rising fuel prices and tighter rules on car registrations after sales there surged by a third to a record in 2010. Daimler, which makes Mercedes-Benz, Smart and Maybacj cars, sold 82 percent more cars in China in the first three months of 2011 than in the year-earlier period. But that growth rate slowed to 43 percent in May, dragging monthly total group sales growth to a single-digit percentage from more than 10 percent over the first four months of the year. But Zetsche said Daimler's business was diverse enough -- with operations in North America and Europe as well as emerging markets selling cars, trucks, vans and buses -- to balance volatility in emerging markets.